Alfred R. Waud, artist, June 10, 1861. The Battle of Big Bethel was one of the earliest land battles of the American Civil War. It took place on the Virginia Peninsula, near Newport News, on June 10, 1861. Virginia's decision to secede from the Union had been ratified by popular vote on May 23, and Confederate Col. (later Maj. Gen.) John B. Magruder was sent down the peninsula to deter any advance on the state capital Richmond by Union troops based at the well-defended post of Fort Monroe. This garrison was commanded by Maj Gen. Benjamin Butler, a former Massachusetts lawyer and politician, who established a new camp at nearby Hampton and another at Newport News. Magruder had also established two camps, within range of the Union lines, at Big Bethel and Little Bethel, as a lure to draw his opponent into a premature action. 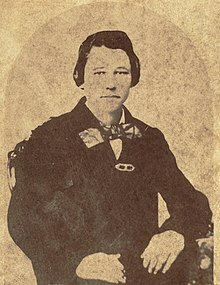 Butler took the bait, when he and an aide, Maj. Theodore Winthrop, devised a plan for a dawn attack on June 10, after a night march to drive the Confederates back from their bases. Butler chose not to lead the force in person, for which he was later criticized. The plan proved too complex for his poorly-trained subordinates to carry out, especially at night, and his staff had also omitted to communicate the passwords. They were trying to advance without knowledge of the layout or strength of the Confederate positions, when a friendly fire incident gave away their own. The commander in the field, Massachusetts militia Gen. Ebenezer Peirce, received most of the blame for the failed operation. The Union forces suffered 76 casualties, with 18 killed, including Maj. Winthrop and Lt. John T. Greble, the first regular army officer killed in the war. The Confederates suffered only eight casualties, with one killed. Although Magruder subsequently withdrew to Yorktown and his defensive line along the Warwick River, he had won a propaganda victory and local Union forces attempted no further significant advance until the Peninsula Campaign of 1862. While small in comparison to many later battles, Big Bethel attracted exaggerated importance because of the general feeling that the war would be short. The engagement was also known as the Battle of Bethel Church or Great Bethel. After the American Civil War began with the formal surrender of Fort Sumter to Confederate forces on April 14, 1861, and President Lincoln's call for volunteers to suppress the rebellion on April 15, 1861, Virginia's political leaders quickly set in motion the process of seceding from the Union and joining the Confederacy. Even before secession was formally accomplished, Virginia agreed to coordinate its state military forces with the Confederacy and began to seize federal property. The United States Regular Army garrison under the command of Col. Justin Dimick held Fort Monroe, a nearly impregnable fortress at Old Point Comfort on the southern tip of the Virginia Peninsula between the York River and the James River where they empty into Chesapeake Bay. The bay was to the east of the fort and Hampton Roads  was to the south. The fort was supported by the Union Navy at Hampton Roads and could be reinforced and resupplied by water without attack by shore batteries or harassment by the nearly non-existent Virginia or Confederate naval forces. The fort was nearly immune from attack from the land side since it could be approached only over a narrow causeway and a narrow isthmus and had massive walls and hundreds of cannons. An inlet called Mill Creek was the body of water that almost cut the fort off from mainland of the Peninsula. Because Massachusetts militia forces were ready to respond to President Lincoln's call for volunteers, two 90–day regiments, the 3rd Regiment Massachusetts Volunteer Infantry (3 Month Militia) commanded by Col. David W. Wardrop and the 4th Regiment Massachusetts Volunteer Infantry (3 Month Militia) commanded by Col. Abner B. Packard, were able to reinforce Fort Monroe's garrison of 415 regulars within five days of the President's call. The 4th Massachusetts Infantry was the first to arrive. These reinforcements helped assure that this strong point and base of operations would be fully prepared for defense and saved for the Union. On May 13, 1861, the 1st Regiment, Vermont Volunteer Infantry under Col. J. Wolcott Phelps joined the garrison and several other volunteer regiments from New York soon followed. While Col. Dimick remained in command of the 415 regular army soldiers, Volunteer Maj. Gen. Benjamin F. Butler of Massachusetts took command of Fort Monroe and the entire garrison on May 23, 1861. With continuing reinforcements, Butler could not only retain the Union hold on Fort Monroe but support the Union blockade of Chesapeake Bay, move up the Peninsula and threaten to retake Norfolk, Virginia, and other locations on the south side of Hampton Roads from the Confederates. The 4th Massachusetts Regiment works to fortify Camp Butler. Confederate earthworks at Big Bethel. Map of Big Bethel Battlefield core and study areas by the American Battlefield Protection Program. Colonel Abram Duryée led the 5th New York Volunteer Infantry from their positions at Camp Hamilton and despite some delays arrived near Little Bethel at about 4:00 a.m. Part of this regiment under Captain (later Brigadier General) Judson Kilpatrick captured three Confederate pickets before dawn and were in position to continue the advance as planned. Before Duryée's men could advance close enough to the Confederate positions to open the attack, they heard gunfire behind them. After the attack by Bendix's men, Peirce pulled his force back to south of the New Market Bridge, a counter-march of about 1.5 miles (2.4 km) to assess the situation and to await an expected further Confederate attack in a more advantageous position. To the dismay of all, it was soon discovered that Bendix had opened fire with muskets and an artillery piece on the 3rd New York Infantry and the commanding general's party, wounding 21 men (two mortally) and causing dozens of other men to flee the field. At this time, the colonels of various regiments, in particular Duryea and Washburn, advised Peirce to call off the operation. However, Butler's aides, Major Winthrop and Captain Haggerty, urged Peirce to move forward,   and he chose to continue with the attack. By chance, Magruder had started a large part of his force toward Hampton to launch a surprise attack of his own on the Union forces. After hearing the gunfire and being alerted by an elderly local lady that a Union force was only a few hundred yards down the road, Magruder hurried his men back to his fortifications at Big Bethel. The Confederates were now fully alerted to the Union Army movement and were able to get back into position well before Peirce's men arrived at Big Bethel. Union skirmishers went forward to try to determine the strength of the Confederate position. Most were driven back immediately. Two companies from the 5th New York led by Captain Kilpatrick and Captain John G. Butler, the General's nephew, advanced across an open field with only a few trees, a shed and a house for cover. An artillery shot went through the house and killed one of the men. Around noon, the 3rd New York Infantry led by Colonel Townsend came forward to the skirmishers' position. They tried to attack the forward Confederate position but could advance only to within 500 feet (150 m) before being forced to lay down due to the heavy Confederate fire. Townsend feared he was being flanked and began to withdraw just as the Confederate howitzer facing his position broke and the Confederate commander in the redoubt, Colonel William D. Stuart, pulled his 200 men of the 3rd Virginia Infantry back to a hill near the church. Stuart also feared he was being flanked. Part of the 5th New York Infantry which was attacking alongside the 3rd New York temporarily seized this position but were unable to hold it. Townsend had nothing to fear from the men on his left because they were a company of his own regiment who had become separated from the main body. By the time this was discovered, Townsend had pulled back. Magruder did not want to give up the advantageous forward position and sent Stuart back with another howitzer and reinforcements from the 1st North Carolina Volunteer Infantry Regiment. This Confederate move and Townsend's retreat left the 5th New York unsupported and they had to withdraw from their captured position as well. Renewed fire from the regained Confederate position insured that neither Townsend nor Duryee would move forward against this position again. Total Federal casualties at the Battle of Big Bethel and the friendly fire incident which preceded it were 76, including 18 killed, 53 wounded and 5 missing. Poland, 2006, p. 238 gives an account of the Union casualties by regiment as follows: Staff: 1 killed (Winthrop); 4th Massachusetts: 1 killed; 1st New York: 1 killed; 2d New York: 2 killed, 1 wounded; 3rd New York: 2 killed, 27 wounded or missing; 5th New York: 6 killed, 13 wounded; 7th New York: 3 killed, 7 wounded, 2 missing; 1st Vermont: 2 killed, 3 wounded, 1 missing; Second U.S. Artillery: 1 killed (Greble). Union forces attempted no further advance on the Virginia Peninsula until the Peninsula Campaign of 1862. However, Butler did send an expedition up the Back River with naval support on June 24, 1861 which destroyed 14 transports and several small boats which had supplies for the Confederate forces. Both sides generally continued to hold and improve their positions and works until the Peninsula campaign began. Major Randolph's artillery and Colonel D. H. Hill's 1st North Carolina infantry troops were commended by Magruder for their actions. Within hours of the battle, Magruder withdrew his forces to Yorktown, where he established a line protected by the Warwick River. Magruder feared another larger and better planned Union attack on his position and felt he should maintain his defense at Yorktown and along the Warwick River. The press in the Confederate States in particular made the Confederate victory appear to be more momentous than it was and greatly exaggerated the number of Union soldiers killed in the battle, a common reaction by both sides to battles in 1861. At the time, the outcome of the battle was an important boost to Southern confidence and morale. Along with the Confederate victory at the Battle of First Bull Run (Battle of First Manassas) six weeks later, it provided what proved to be undue encouragement and confidence in a quick victory in the war to the Confederates. Union morale was correspondingly damaged but as events proved, the Northern public and military showed resilience and determination in the face of several early defeats. Big Bethel was one of the first Civil War land battles both in present-day Virginia and in the war after the bombardment and surrender of Fort Sumter. Although arguments have been made that either the Battle of Philippi, on June 3, 1861, in present-day West Virginia (then part of Virginia) or the Battle of Big Bethel was the first land battle of the entire war, the Battle of Fairfax Court House (June 1861)  took place in Fairfax County, Virginia on June 1, 1861, two days earlier than the Battle of Philippi and nine days before the Battle of Big Bethel. Historian David J. Eicher discounts both the Battle of Fairfax Court House and the Battle of Philippi as "mere skirmishes" and says the first "real land battle of the conflict" was the Battle of Big Bethel, although after a brief summary of the Battle of Big Bethel he characterizes the early Civil War engagements without apparent distinction as "these first minor skirmishes." The Baltimore riot of April 19, 1861 might also be considered a small Civil War battle, with several killed and wounded on each side, but the Confederate side in the affair was a civilian mob, not an organized military force like the force the mob attacked, which was several companies of the 6th Massachusetts Militia. Civilian mobs also were engaged with military forces in two similar riots in St. Louis in the early days of the war after the surrender of Fort Sumter. Compared to the large battles to come, all the engagements before the Battle of First Bull Run (Battle of First Manassas) are fairly characterized as mere skirmishes. ^ The water area known as Hampton Roads is one of the world's biggest natural harbors (more accurately a roadstead or "roads"), and incorporates the mouths of the Elizabeth River and James River with several smaller rivers and itself empties into the Chesapeake Bay near its mouth leading to the Atlantic Ocean. ^ McKean, William Vincent. The National almanac and annual record for the year 1863, Volume 1. Philadelphia: George W. Childs, 1863. OCLC 20269046. Retrieved May 31, 2011. ^ In 1952 Elizabeth City County was absorbed by the independent city of Hampton, which had been the county seat and largest town in the county. ^ On that same day a popular vote ratified the secession of Virginia. ^ Authoritative sources, including his tombstone, show Peirce is the correct spelling of the general's name although in some accounts it is mistakenly shown as "Pierce." ^ The secession of Virginia was ratified by popular vote on May 23, 1861. Although a formality, Virginia Gov. Letcher did not issue a proclamation officially transferring Virginia forces to the Confederacy on June 6, 1861. United States War Dept., Robert Nicholson Scott, et al. The War of the Rebellion: a compilation of the official records of the Union and Confederate Armies Series I, Volume II. Washington: Government Printing Office, 1880. OCLC 427057. Retrieved May 14, 2011. p. 911-912. The delay was caused mostly by negotiations over whether the State or the Confederacy would control certain property. Maj. Gen. Lee, as commander of the state forces, issued an order in compliance with the proclamation on June 8, 1861. ^ Quarstein, 2000, p. 44 says that Montague's cavalry force preceded these units on June 6 and that they did not arrive until June 7. ^ Quarstein, 2000, p. 45 credits Winthrop alone for the plan but Winthrop's own notes state, somewhat poetically, that it was a joint project. The Atlantic Monthly Volume VIII, August 1861. p. 251. In 1997, Quarstein, John V. The Civil War on the Virginia Peninsula. Charleston, SC: Arcadia Publications, 1997. ISBN 978-0-7385-4438-0. Retrieved June 11, 2011, p. 37 referred to the plan as devised by Butler. ^ Cobb, J. Michael, Edward B. Hicks and Wythe Holt. Battle of Big Bethel: Crucial Clash in Early Civil War Virginia. El Dorado Hills, CA: Savas Beatie LLC, 2013. ISBN 978-1-61121-116-0. p. 75. 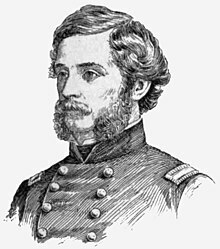 ^ As colonel of the 29th Regiment Massachusetts Volunteer Infantry, Peirce lost an arm leading a charge on June 30, at the Battle of White Oak Swamp. Cobb, 2013, p. 161. ^ Tomes, Robert. The War with the South: A History of the Great Rebellion. Volume 1 of 3. New York: Virtue and Yorston, 1862–1867. OCLC 476284. Retrieved June 11, 2011. p. 272. ^ Cobb, 2013, p. 79. ^ Gordon, 1883, p. 28 says: "We had white bands on our hats to distinguish us from the enemy...."
^ Major Whittemore of the 4th Massachusetts Infantry wrote that he had rode out in front alone, discovered the mistake and got the New Yorkers to cease firing. ^ Gordon, 1883, p. 30 said: "The Federal guns were well handled by Lieutenant Greble, of the regular United States army. Shot after shot struck our earthworks, and but for these defences our loss would have been considerable." ^ One account states the skirmishers were under Captains Kilpatrick, Bartlett, and Winslow, and all were under the command of Lieutenant Colonel (later Major General) Gouverneur K. Warren, who was acquainted with the ground. ^ Some accounts such as Quarstein, 1997, p. 40 mention only Vermont and Massachusetts soldiers in Winthrop's attack. ^ "Photograph of Henry Lawson Wyatt". North Carolina Digital Collections. 1910. p. 2. Retrieved December 20, 2012. ^ Some accounts give the number of Union casualties as 79. ^ Gordon (who was with the Howitzers Battalion), 1883, p. 34, says the Confederates had nine wounded. ^ Some reports showed 9 wounded rather than 7. ^ Gordon, 1883, pp. 33–34 says that 18 Union dead were left on the field and surmises the official Union casualty figures were too low, though the actual figures were nowhere near what were reported in the press, even in the accounts of Union soldiers. ^ OR, Magruder's report, June 10, 1861. ^ Historian David J. Eicher in The Longest Night: A Military History of the Civil War, 2001, p. 74 described the engagement at Fairfax Court House as "ostensibly the first land battle of the war." His use of the word "ostensibly" is made clearer on the next page where he distinguishes as "mere skirmishes" the battles at Fairfax Court House and Philippi and, on p. 75, describes the Battle of Big Bethel as the "first real land battle" of the war. On the other hand, on p. 77 he lumps all the engagements together as "these first minor skirmishes." ^ The Battle of Arlington Mills, which undoubtedly was a small skirmish although one in which a few casualties were incurred, took place in present–day Arlington County, Virginia, also on June 1, 1861. ^ Eicher, 2001, p. 75. He says on p. 75 in regard to the Battle of Philippi: "Although this minor skirmish was glorified in the press ... it had little significance." The Atlantic Monthly Volume VIII, August 1861. p. 251. Cobb, J. Michael, Edward B. Hicks and Wythe Holt. Battle of Big Bethel: Crucial Clash in Early Civil War Virginia. El Dorado Hills, CA: Savas Beatie LLC, 2013. ISBN 978-1-61121-116-0. Gordon, E. Clifford. The Battle of Big Bethel. Richmond, VA: Carlton McCarthy and Co., 1883. Contributions to a History of the Richmond Howitzer Battalion, Pamphlet No. 1. Richmond, VA: Carlton McCarthy and Co., 1883. Contributions to a History of the Richmond Howitzer Battalion, Pamphlet No. 3. Richmond, VA: Carlton McCarthy and Co., 1884. Contributions to a History of the Richmond Howitzer Battalion, Pamphlet No. 4. Richmond, VA: Carlton McCarthy and Co., 1886. Extracts from an old order book, First Howitzers of Richmond, VA. OCLC 83619463. Retrieved June 9, 2011. Hansen, Harry. The Civil War: A History. New York: Bonanza Books, 1961. OCLC 500488542. Hotchkiss, Jed. Confederate Military History: Virginia. Volume III. Clement A. Evans, ed. Atlanta: Confederate Publishing Company, 1899. OCLC 951143. Retrieved June 11, 2011. Johnson, Robert Underwood, and Clarence C. Buel, eds. Battles and Leaders of the Civil War. 4 vols. New York: Century Co., 1884–1888. OCLC 2048818. Lossing, Benson John and William Barritt. Pictorial history of the civil war in the United States of America, Volume 1. Philadelphia, George W. Childs, 1866. OCLC 1007582. Retrieved May 1, 2011. McKean, William Vincent. The National almanac and annual record for the year 1863, Volume 1. Philadelphia: George W. Childs, 1863. OCLC 20269046. Retrieved May 31, 2011. Poland, Jr., Charles P. The Glories Of War: Small Battles and Early Heroes Of 1861. Bloomington, IN: AuthorHouse, 2006. ISBN 1-4184-5973-9. Quarstein, John V. The Civil War on the Virginia Peninsula. Charleston, SC: Arcadia Publications, 1997. ISBN 978-0-7385-4438-0. Retrieved June 11, 2011. Quarstein, John V. "First Blood at Big Bethel." Civil War Times vol. L, no. 2 (April 2011): 48-53, 79. Quarstein, John V. and Dennis P. Mroczkowski. Fort Monroe: the Key to the South. Charleston, SC: Tempus Publications, 2000. ISBN 978-0-7385-0114-7. Scharf, John Thomas. History of the Confederate States Navy From Its Organization to the Surrender of Its Last Vessel. New York: Rogers & Sherwood, 1887, p. 39. OCLC 317589712. Retrieved February 1, 2011. Schouler, William. A History of Massachusetts in the Civil War. Volume 1. Boston: E.P. Dutton & Company, 1868. OCLC 2662693. Retrieved June 12, 2011. The Union Army: Cyclopedia of battles. Volume V, A to Helena. Madison, Wisconsin: Federal Publishing Company, 1908. OCLC 78364034. Retrieved June 8, 2011. U.S. War Department. The War of the Rebellion: a Compilation of the Official Records of the Union and Confederate Armies. Washington, DC: U.S. Government Printing Office, 1880–1901. Series I, Volume 2 [S# 2], Chapter IX. Kennedy, Frances H., ed. The Civil War Battlefield Guide. 2nd ed. Boston: Houghton Mifflin Co., 1998. ISBN 0-395-74012-6. p. 6.